Yakitori sauce makes chicken stunningly delicious, but what makes up the Yakitori sauce? If you’ve ever been out for an authentic Japanese meal, it is likely that skewered chicken has been part of the main event, and it is true that the secret really is in the sauce. After all, grilled chicken is just plain grilled chicken when it comes without the spices. By now you are dying to know, what’s in that sauce?! Well, the traditional yakitori sauce, you’ll find it called tare, consists of soy sauce, sake, mirin (rice wine) and sugar. It must balance the sweetness against the salty tones, it may have fresh grated ginger, or not, and it is impressive when served with scallions. So, what exactly are scallions? They aren’t as exotic as you may think. They are actually green onions which can be harvested either from very young bulb-forming onions, or from onion varieties that never form bulbs at all. What’s wonderful about them is that they aren’t intensely onion-y. They tend to be on the more mild, rather than the wild, side – and the entire green and white part is edible, save for the roots. Asian cuisine embraces them wholly and you should too! With an extra bunch of scallions on hand, we encourage you to explore more dishes of Asian cuisine – how about a steaming bowl of Thai coconut soup? Or some tempting Chinese five-spice meatballs? Add the garlic, ginger, and pepper flakes, cook 1 minute stirring. Pour in the sake (or dry white wine) and vinegar and boil until reduced by half. Pour in the coconut aminos and bring to a light boil; add the honey, lower the heat, and simmer 10 to 12 minutes. Mix the potato starch with 1 tbsp. of water and slowly add to the sauce while whisking until it thickens, add another tablespoon of starch if you want a thicker sauce. 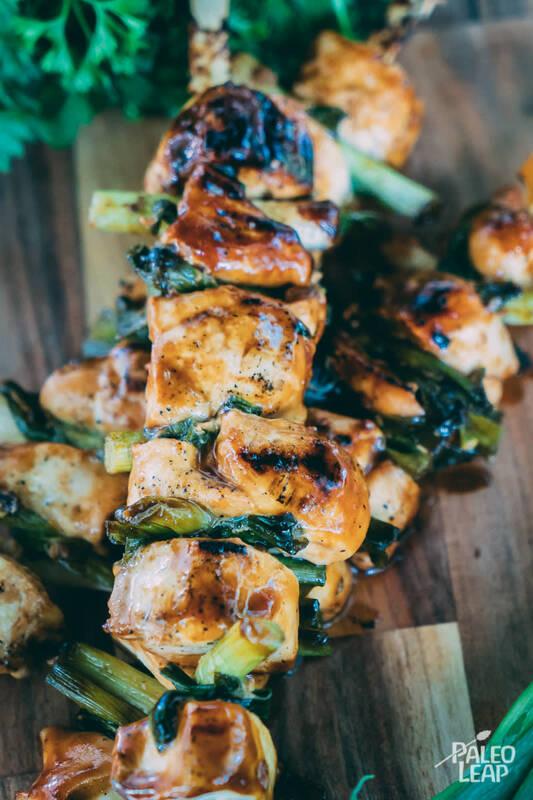 Thread the scallions and chicken alternatively on the skewers and season to taste. Brush the skewers with the sauce generously, and place on the grill. Grill 12 to 15 minutes, turning every 2 minutes or so, and brush with the remaining sauce. Let cool 2 to 3 minutes and serve.